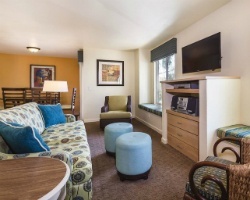 *Wyndham Tropicana at Las Vegas* offers easy access to The Strip while set in a quiet neighborhood 2.5 miles away. The location is perfect for those who prefer a more tranquil resort experience. Spend your days lounging by the beautiful pool or relaxing in your choice of five hot tubs. Work out in the fitness room or play some games at the recreation center. Barbecue grills are available for the guests as well. To discover more, please visit www.clubwyndham.com. Rental is available in week 3, January 18th through January 25th, 2019! Inquire for details!